Check out our full review of the 84-inch 4K Ultra HDTV LG 84LM9600. Earlier this week, LG held a launch event in Southern California to debut the company’s first Ultra HD (4K) television at a sizable list price of $19,999. 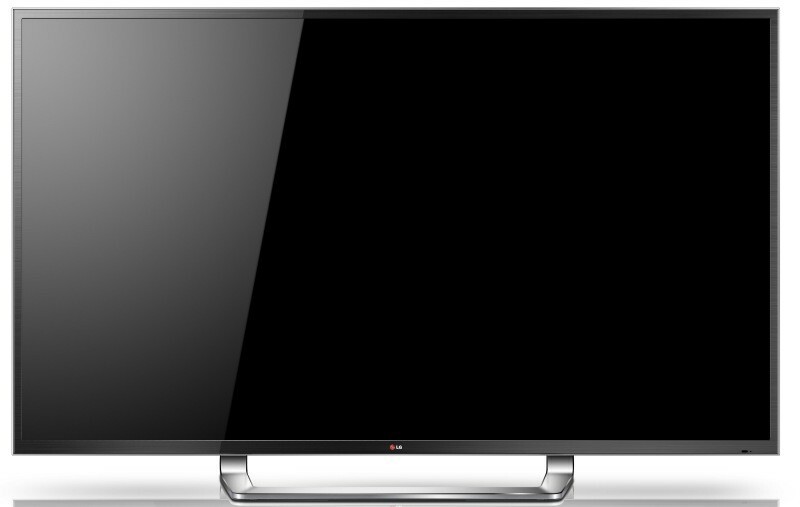 The LG 84LM9600 has a native screen resolution of 3840 x 2160, four times the resolution of a typical 1080p television. 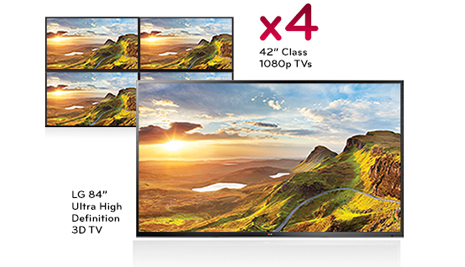 While the amount of content available in Ultra HD resolution is incredibly scarce at the moment, the 84-inch LED Ultra HD panel also includes LG’s proprietary “Resolution Upscaler Plus” technology to up-convert 1080p content to the Ultra HD resolution. Regarding size, the 84-inch screen is the equivalent of four 42-inch, 1080p panels stacked in a rectangle shape. While the television does include technology to allow consumers to watch 3D movies, an interesting feature directed at gaming consumers allows two players to play a multiplayer game without the need for split screen. Using glasses that are sold separately, the television is simultaneously displaying two video feeds and each pair of glasses is designed to pick up a specific feed. In regards to 3D content, LG is including six pairs of flicker-free -glasses with the Ultra HD set. Flicker-free glasses are identical to glasses found within movie theaters, thus it’s inexpensive to add or replace glasses. Similar to other panels in the LG lineup, the company also includes a 2D-to 3D conversion feature with the set. While the massive panel is just 1.57-inches thick, the television is over 150 pounds in weight plus another 25 pounds for the stand. Consumers will have to be careful when wall mounting the LG 84LM9600 which may require professional assistance for installation. However, consumers won’t have to worry too much about a wired network connection near the home theater as the 84-inch television comes with built in Wi-Fi. The television ties into LG’s Smart TV ecosystem, so consumers will have access to plenty of applications like Netflix, Facebook, Vudu, Skype and Hulu Plus. The LG Ultra HD panel includes the gesture system and “Magic remote” found on other LG televisions. Consumers have to make gestures with the remote to interact with menus on the screen in addition to using voice commands. Specific to sound, the television includes a 10-speaker system rated at 50 watts. The 84-inch panel also has a significant amount of audio and video inputs. Besides four HDMI inputs and three USB 2.0 inputs, the LG set includes an Ethernet port, antenna/cable input, composite audio / video input, component video input, RGB PC input and PC audio input. In addition, there is an optical digital audio output to send audio content to a receiver. While the list price on the television set nearly breaks $20,000, the sales price in stores will likely be around $16,999 according to LG management. However, it’s highly unlikely that an online retailer like Amazon will carry the massive television. According to LG’s site, there are currently no online retailers stocking the television yet and it can only be purchased at a handful of high-end home theater stores. To date, the only other Ultra HD television that will be available to consumers this year is Sony’s 84-inch XBR-84X900. However, the list price of Sony’s television is significantly higher. On the Sony store site, the price of the display is $24,999.99.